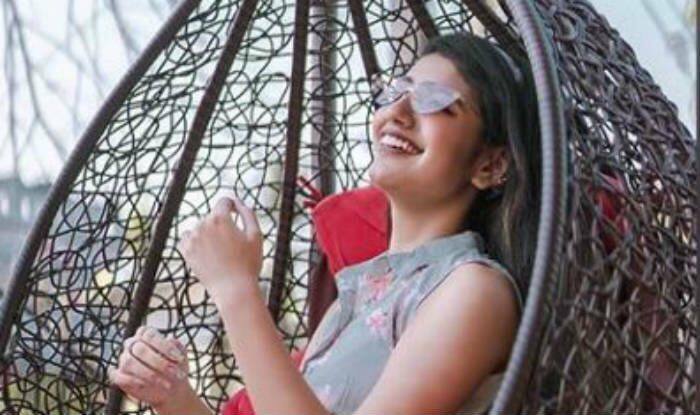 Malayalam actor Priya Prakash Varrier, who rose to fame overnight with her wink expression, is taking the internet by storm with her pictures on social media. She never shies away to flaunt her style statement and gives major fashion goals to her fans. Now, she took to Instagram to share her picture enjoying the day as she sits on a cushion hanging chair. In the photo, she can be seen donning a floral grey dress teamed up with funky shades. Subtle makeup, bold lipstick and a wide smile on her face make her look gorgeous, as ever. With 6.8 million followers, she never misses to impress the fashion police and her fans with her sartorial choices. The picture is going viral and has fetched over 76,000 likes within a couple of minutes. Recently, the ‘wink girl’ of the internet has been in the news for after she blatantly copy-pasting a promotional message on her Instagram account. The copy-paste goof up grabbed the attention of her followers who ended up trolling her. However, the Oru Adaar Love actress corrected the caption but before she could do that the internet was quick enough to take the screenshots. Even the screen grabs made its way to the internet. She captioned her post as, “Text content for Instagram and Facebook” followed by a long description of the product to promote the brand. In the picture, she can be seen donning a beautiful off-shoulder peach dress. She teamed up her look with subtle makeup, a pair of earrings and minimal jewellery. She has kept her hair curly and has tied half tresses leaving behind rest to fall back.